Caleb Lawrence McGillvary, the 24-year-old viral-video vagrant charged with murdering a New Jersey lawyer, has attempted suicide in jail. The self-inflicted wounds are not considered life-threatening, but he remains guarded at a local hospital. 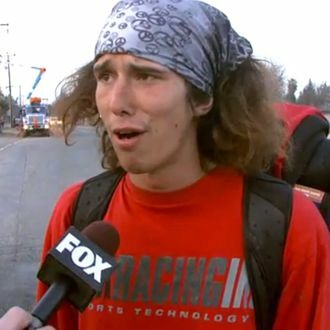 Kai, as the free spirit is known in his “Hatchet-Wielding Hitchhiker” star turn, was arrested in May for allegedly beating 73-year-old Joseph Galfy Jr. to death at his home after the two met in Times Square. Kai implied in a vague Facebook post that he was drugged and sexually assaulted. This story just keeps getting darker.